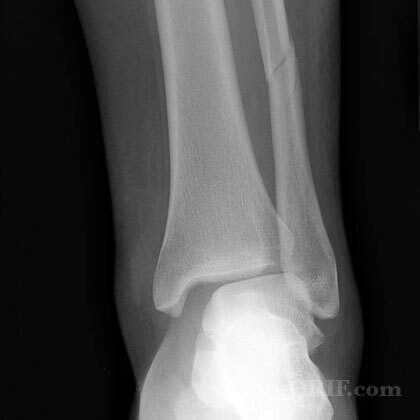 -Weber A (below ankle joint level): Treatment = perfrom stress views/exam to eval for Syndesmosis injury(uncommon). If stable: walking cast/brace. Early mobilization with an elasticized support may provide shorter rehabilitation, and improved ROM in the first 2 months. (Port AM, JBJS 1996;78B:568). 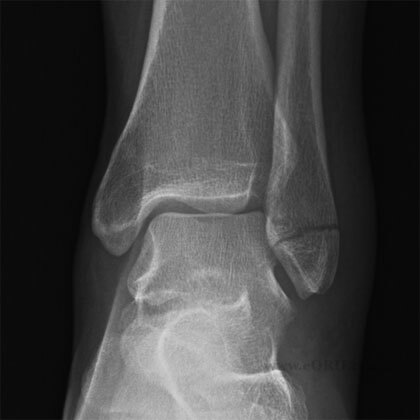 -Weber B (at level of ankle joint): Treatment = perfrom stress views/exam to eval for Syndesmosis injury. If stable: walking cast/brace. Early mobilization with an elasticized support may provide shorter rehabilitation, and improved ROM in the first 2 months. (Port AM, JBJS 1996;78B:568). If unstable: ORIF +/- syndesmotic fixation. 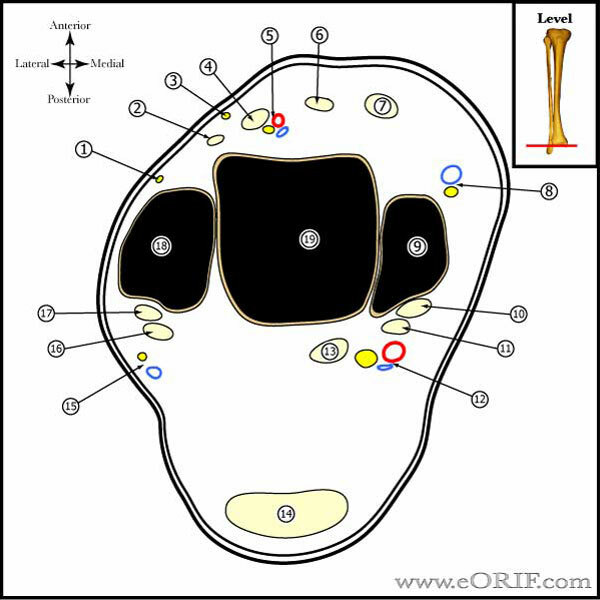 -Weber C (above level of ankle joint): Generally unstable. Treatment: ORIF with syndesmotic fixation. 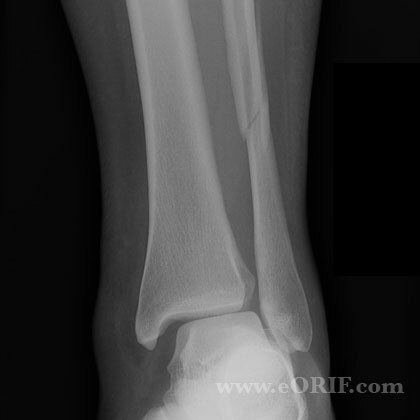 Syndesmosis injury:if medial clear space increases with external rotation stress, or fibula fx >4.5cm above joint; ORIF of ankle fracture, fix syndesmosis in dorsiflexion with fibula reduced into incisura fibularis, HWR after 12 wks. Stiehl JB: Ankle fractures with diastasis, in Greene WB (ed): Instructional Course Lectures XXXIX. Park Ridge, IL, American Academy of Orthopaedic Surgeons, 1990, pp 95-103. Phillips WA, Schwartz HS, Keller CS, et al: A prospective, randomized study of the management of severe ankle fractures. J Bone Joint Surg 1985;67A:67-78. McConnell T, Creevy W, Tornetta P 3rd. 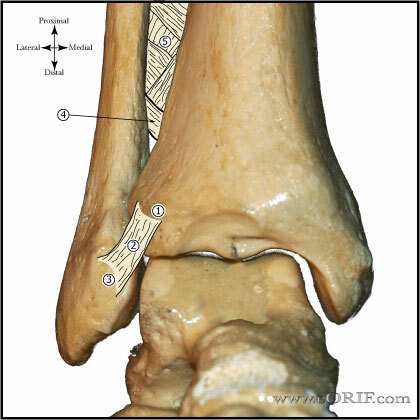 Stress examination of supination external rotation-type fibular fractures. J Bone Joint Surg Am. 2004 Oct;86-A(10):2171-8. Egol KA, Amirtharajah M, Tejwani NC, Capla EL, Koval KJ. 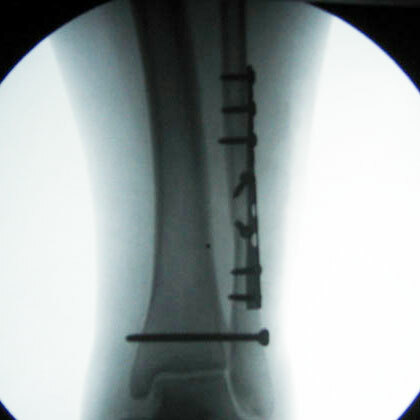 Ankle stress test for predicting the need for surgical fixation of isolated fibular fractures. J Bone Joint Surg Am. 2004 Nov;86A(11):2393-8. Koval KJ, Egol KA, Cheung Y, Goodwin DW, Spratt KF. Does a positive ankle stress test indicate the need for operative treatment after lateral malleolus fracture? A preliminary report. J Orthop Trauma. 2007 Aug;21(7):449-55.